By considering an electrolyte solution in motion in a duct under a transverse magnetic field, we notice that a so called Faraday voltage arises because of the Lorentz force acting on anions and cations in the fluid. When salt water is considered, hydrogen production takes place at one of the electrodes if an electric current, generated by Faraday voltage, flows in an external circuit. The maximum amount of hydrogen production rate is calculated by basic electrochemical concepts. where is the volume density of both types of ions and e is the electron charge. Mobility, on its turn, is defined as the proportionality constant linking the ions velocity and the electric field , according to the following: . We recall that the total conductivity s is given by . where the plus and minus signs refer to cations and anions, respectively, both assumed to have ionic charge Ze in absolute value (Z thus being their valence). Because of Lorentz force, a voltage difference , known in the literature as Faraday voltage [2,3], appears between the electrodes A and B of Figure 1. This voltage, similarly to what observed in the Hall’s effect in metals , can be expressed as the product , when the electrolyte flows in a circular pipe of diameter D. Notice that in the present work boldface letters and corresponding plain text letters are used for vectors and their amplitudes, respectively. Geselowitz  has shown that this result is valid for any velocity profile, provided the flow is axially symmetric. It can also be shown that this result is valid, in particular, for a thin rectangular wire . Figure 1. Schematic representation of the system: salt water flows through a rectangular pipe of section 4wh (2w is the width and 2h is the height) with velocity v in a volume of length L where a magnetic field B0, orthogonal to V, is present. Because of Lorentz force, the charged ions in the solution accumulate in the vicinities of the lateral conducting plates, generating, at equilibrium, a constant electric field E.
ter flowing within the rectangular pipe. Experimental work is awaited to provide validation of the proposed analysis and to suggest further development of the topic of hydrogen production by salt water. Notice that a factor of two appears in Equation (4), differently from what reported by Yamaguchi et al. , because of the presence of two ionic species in the electrolyte in our case. A detailed analysis of the dynamical problem is given in the Appendix, also to clarify how the low mobility coefficients for sodium and chlorine ions give drift velocities which are in amplitude much smaller than . where and a multiplicative factor of 4 is present when comparing the above result with that obtained by Yamaguchi et al., because of Equation (4). Figure 2. Equivalent circuit for an electric power generator with an open-circuit voltage f0. 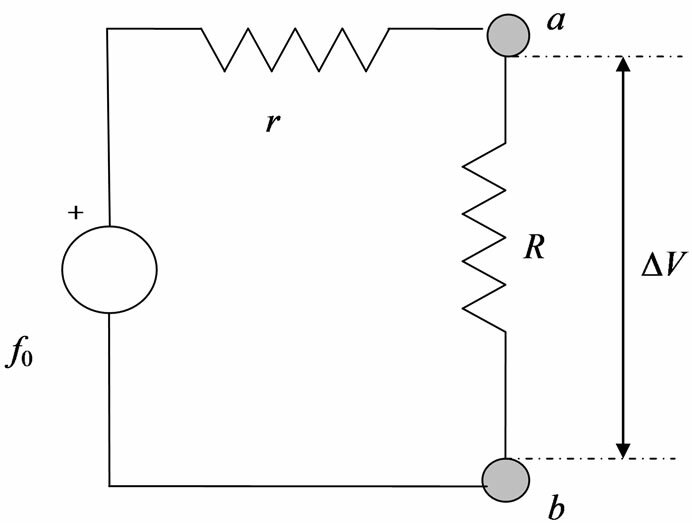 When the internal resistance r is connected in series with an external load R, the output voltage is ΔV. Maximum power output is attained for . , and , we have and . Notice that the power output depends on the square of the average velocity , in such a way that the device may be effective also in cases where the periodic motion of seawater could be used. The above calculation has been performed by assuming that the concentration of salt in water is sufficient to allow circulation of current in the system. However, as suggested by Wright and Van der Beken , and as calculated by the author , the average salinity of salt water is by far sufficient for current circulation in the system. The reaction in (8) implies production of sodium hydroxide and hydrogen gas at the positively charged electrode. Therefore, also confiding on the experimental evidence in ref. , we may argue that it is possible to device an e.m.f. generator by letting salt water run in a pipe with average velocity under an orthogonal magnetic field and that, at the same time, it is also possible to produce hydrogen gas by this type of device. where . As it appears from Equation (9), N is much less than the total number of charged ions flowing in a time in the region of length L of the rectangular pipe. We now need to compare the expression of with the maximum current circulating in the device when an external load of resistance is applied to it. Therefore, since , we have , which confirms the possibility of having ionic conduction according to the picture represented in the previous section.
. Therefore, by taking again , , , and , we have . In the present work it has been shown that an electromotive force generator can be realized by letting salt water run though a rectangular pipe under the influence of a transverse magnetic field. Because of Lorentz force on the moving sodium and chlorine ions in salt water, one can shown that an equilibrium electric field can be created by the accumulation of charged ions in the vicinities of the lateral conducting plates. By considering the problem in one dimension, it can be shown that the charge distribution varies linearly from one electrode to the other, if the velocity profile of the fluid in the pipe is parabolic . Furthermore, it can be argued that the electric field across the electrodes can sustain a constant electromotive force , which, on its turn, can generate an electric power output. The device could be used as an alternative electric power source in situations where salt water is forced to run in large closed ducts, as it happens, for example, in some desalination plants. Experiments on small scale devices carried out by Wright and Van Der Beken  for a pipe with circular section do confirm the existence of a Faraday voltage across the device. In the present paper it is also predicted that, according to properties of ions in aqueous solutions, hydrogen gas can be produced at the positively charged lateral conducting plate. The rate of production of hydrogen gas is however small for not large values of salt water flow rate. Nevertheless, the present analysis can be seen as a starting point for further development of similar applications in the realm of alternative energy devices. In particular, provided experimental validation of the electro-chemical properties of the proposed system, one might envision applications where the increase in the concentration or the flow rate of salt water allows better hydrogen production rates and larger power output. C. Kittel, “Introduction to Solid State Physics,” John Whiley, New York, 1959. J. J. Wright and S. Van Der Beken, “The Hall Effect in a Flowing Electrolyte,” American Journal of Physics, Vol. 40, No. 2, February 1972, pp. 245-247. H. S. T. Driver, “Comment on the Hall Effect in a Flowing Electrolyte,” American Journal of Physics, Vol. 46, No. 12, December 1978, pp. 1275-1276. P. Mazzoldi, M. Nigro and C. Voci, “Fisica,” EdiSES, 1998.
and to the viscous force , move relatively to the solvent, considered to be an incompressible viscous fluid medium. Notice that in the case of anions only the second ratio changes sign. It can be finally shown that the ratio is of the order 10–7 for seawater, in such a way that , and .